Daniel Akst is an author and journalist who has written several articles covering the recent prefab and Re-Modern movement. His articles have appeared in the Wall Street Journal, New York Times and he's even written about modern homes for This Old House. 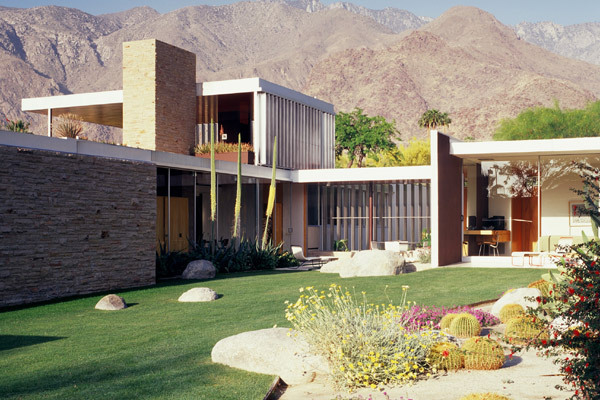 Most significantly he has built his own modern house and written extensively about it. 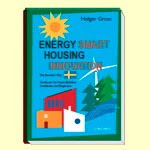 These are a worthwhile read for anybody building their own modern home. Dan first offered up his story in a three part article that appeared in Money Magazine. You can read the text of these articles on his own web site here: Part 1 Part 2 Part 3 He also wrote a shorter account with more of a design emphasis for Metropolis Magazine that you can read at the on their web site: link. Its interesting that at the end of this article Dan calls for the production of decent house plans for modern homes: ...If they did, they might want to use a stock plan; but here is another reason why more interesting houses don't get built, even by individuals who care about good design. Most of the house plans sold through books and on the Internet are awful; a few decent ones are available (including some in the Life magazine's "Dream House" series) but virtually none are Modern, unless what you really want is a chunky-looking "contemporary" with diagonal wood siding. The absence of good Modern stock plans means that people who want this kind of house have to hire an architect, at fees ranging from a few thousand dollars to perhaps 15 percent of the construction cost. Although Modern architecture remains suffused with the rhetoric of idealism, even relatively prosperous families who are thinking of sponsoring it will beg off unless the entire clanking apparatus of home-ownership--all of it geared to the lowest common denominator of design--can be brought around to accommodate something more interesting. 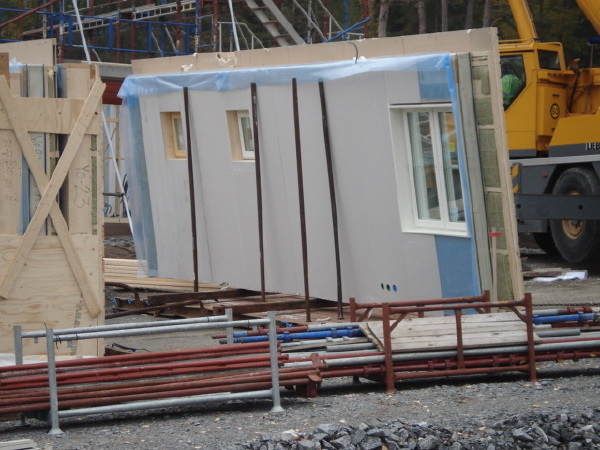 Modular housing might be one answer. Another would be the publication of some first-class stock plans that specify standard materials to achieve quietly fabulous results. Incredibly this is just what we have set out to do, and our customers have in fact done. Dan's article was in the November 2002 issue of Metropolis. Our plan site went live on November 4th, 2002. He's also a good novelist - I've read a couple of his books and enjoyed them. More info about the rest of his work on his web site Akst.com. Continue reading "Building the Modern House - an owners tale by Dan Akst"
Continue reading "Letters from Sweden - land of modern, land of prefab"
Continue reading "Letters from Sweden - conversations with an expatriate builder"
An update today from the owner of the Virginia Plat House. The wall framing is up, and it looks like just a little bit more work on the window side and they will be ready for the roof framing to start. The work looks very good which is always a pleasure to see. What a beautiful scene! Look at that sky. There are a couple more high res shots from this day in the Flickr set for the VA Plat House so take a look. 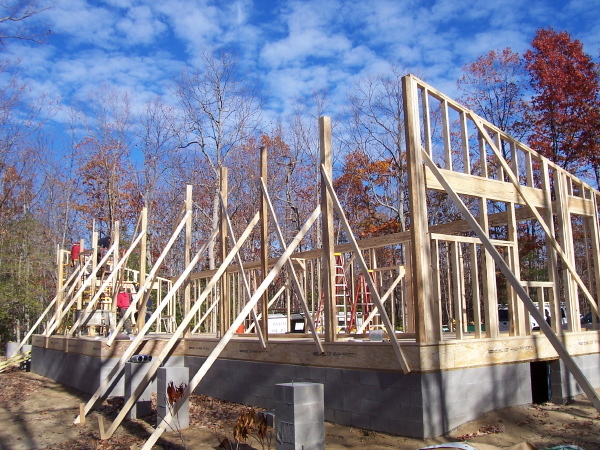 Continue reading "Virginia Plat House - framing up"
The framing is all done and the roofing work has actually begun now. 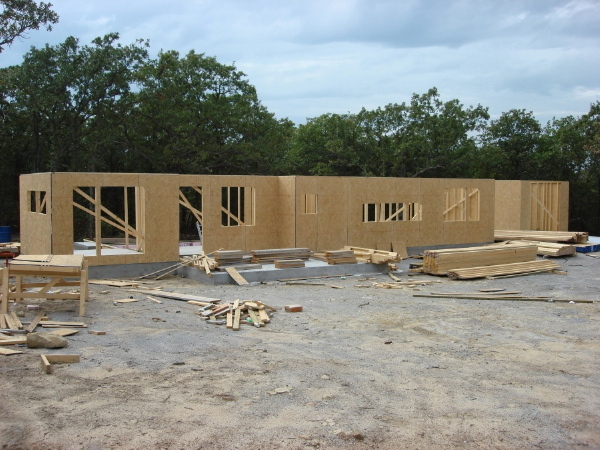 I think we will see the builder moving to make the shell weather tight now that the framing up is all but done. Roofing will go on, house wrap, and windows installed in the lead up to the siding of the house. Above we see the front of the house with just a little work to do on the last bay window, but the roofing felt is already down which means the roofer is on site now while the carpenters are finishing up. Here is the corner of the house next to the carport. Yup, that's a Tray house if I ever saw one. The house is turning out very well and the owner is taking some great process shots. A great fish-eye view of the overlook to the living spaces from the hallway above. These photos and more are posted to their Flickr page, and we have begun mirroring them as well on our own Flickr set as well. You can also find all the photos in the LamiDesign House Plan photo pool. Here is a photo stream of all the new shots. 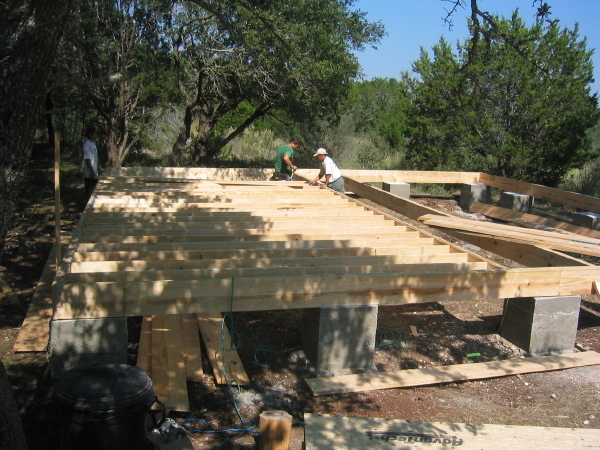 Continue reading "OK Tray House - framing done"
Continue reading "Austin Porch House - framing going gang-busters"
Continue reading "Neutra's iconic Kaufmann House for auction - what's it to you?" The construction prints for the 0738 Palo Alto house have been making slow but steady progress in the background while all our customers have been taking center stage with photos of their builds. But after all that is the way its supposed to be. No matter how many drawings we do, no matter how many renderings of a design we post, people always want to see a real house. 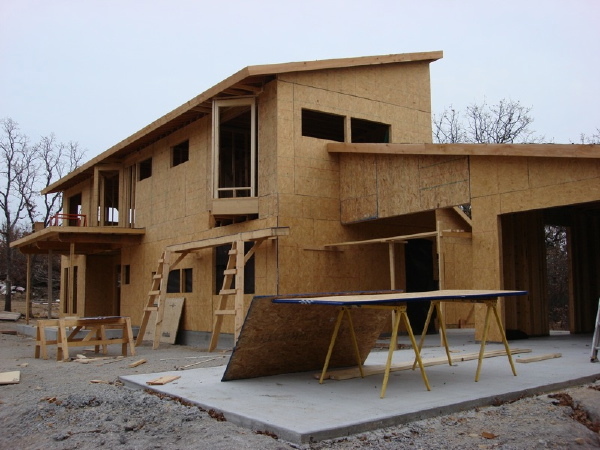 For some seeing somebody else's house under construction is essential evidence of the viability of the plans, without which there is some undue risk that a house could not in fact spring from those paper sheets. 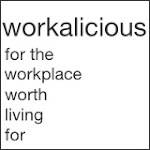 Of course that notion is preposterous. 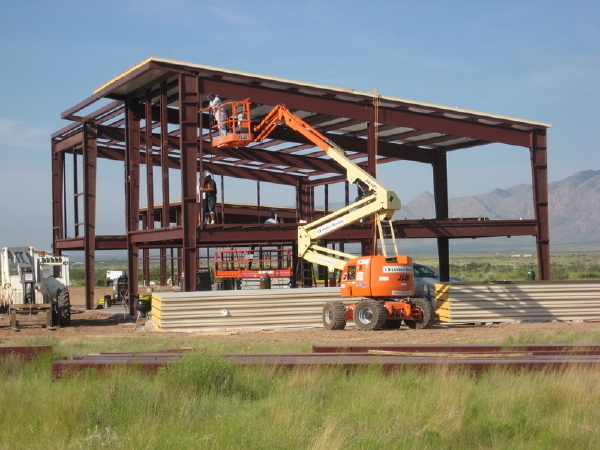 It is a great benefit to be able to see that somebody else has built a given house, and that there is a photo record of construction images that you can access with your builder. It can help remove any uncertainty they may feel if they are faced with building a house that they may consider unusual. But this is an anomaly in an architects practice, that a design would be built repeatedly. 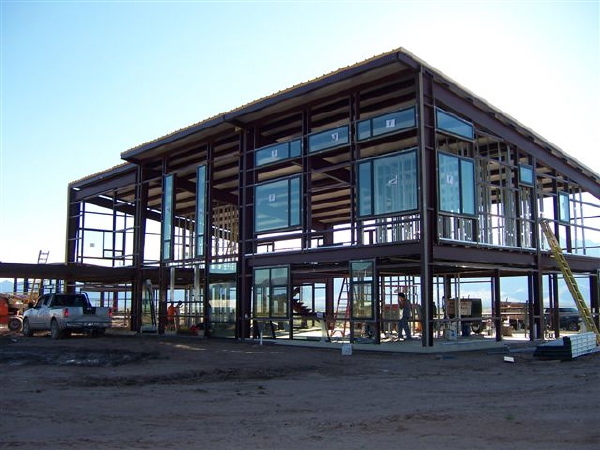 Any architect must be capable of designing and documenting a house or building that has never been built before, no second chances, it must come together from the plans on the first try. 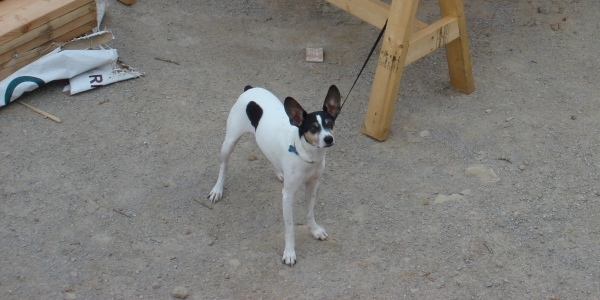 They have to do that every day, as assuredly as you get up every morning, if they hope to be in business the next day. The vast majority of architects I know are very good at that. 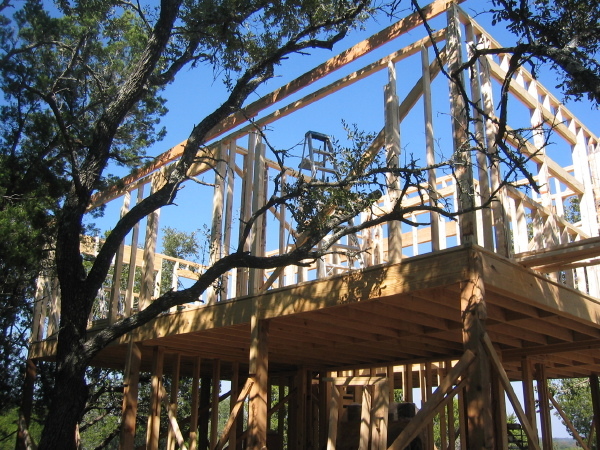 So begone any hesitancy to build a house until you see somebody else build it first. You are doing nothing but delaying your own bliss. The documentation of our house plans are very consistent and the construction of any of them should be sufficient validation that the design practices and content of any of the other designs is just as viable as the ones already built. With that in mind I'd like to report that the Palo Alto construction prints are approximately halfway done. The drawing sheets have all been laid out, except for the wall detail sheet. They require notations and dimensions for completion. 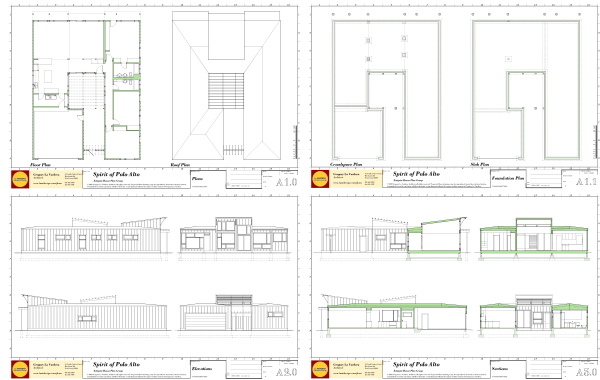 The holidays usually slow the pace of work which makes an opportunity to advance our work on house plans, so we hope that shortly after the new year the prints will be complete. 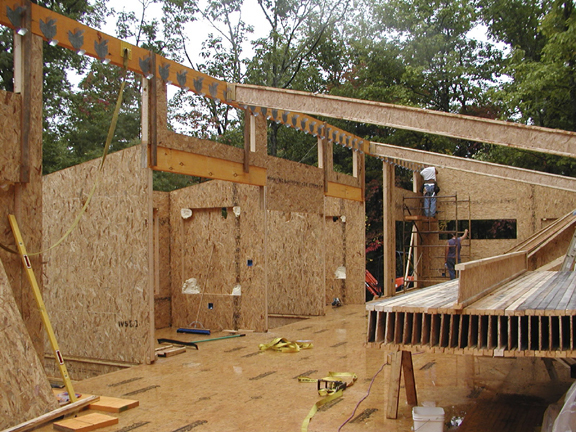 Continue reading "0738 Palo Alto - construction print progress"
I got an email last week from a reader and LiveModern member who built his own house taking inspiration from the info he gathered online. I thought man - that's what its all about. A lot of effort no doubt, but he was inspired to build himself the kind of house that he envisioned his family living their life in. Now not everybody is going to have the time, where-with-all, and nerve to build out the bulk of their house themselves, or even design it. Well, that's why there are house plans. There are people whose skills, time, budget only allow a certain amount of DIY, and that's fine. What we need are the tools, whether it be info online or affordable house designs, that allow people to successfully complete a project. And the more that is done, the more likely it is that builders and developers are going to sit up and notice that there is a burgeoning market right under their noses. His note: Hi Greg, Actually we have never met and I've never emailed you before. Nonetheless I have been all through the lamidesign webpage and have read many of your posts on livemodern. 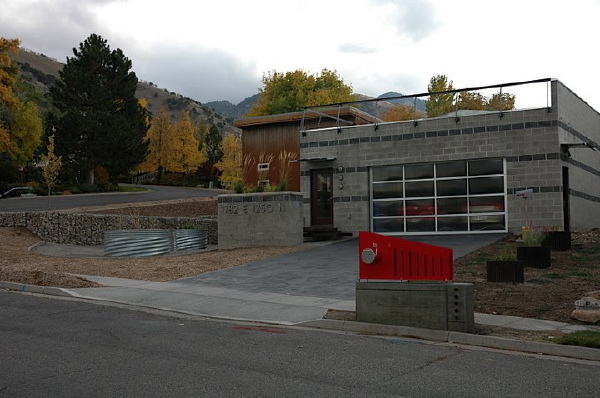 The information I gathered was both very helpful and inspirational as I designed and helped build our small house in Logan, Utah. Some shots of the house are at http://picasaweb.google.com/mikew.usu/LoganHouse Thanks for all you do out there! Check out his link and see his great house! Post about it here - he will be reading! Continue reading "An inspiring photo blog"
While we've been snoozing here the Oklahoma Tray house has been just booking! Never fast enough for an enthusiastic owner though. 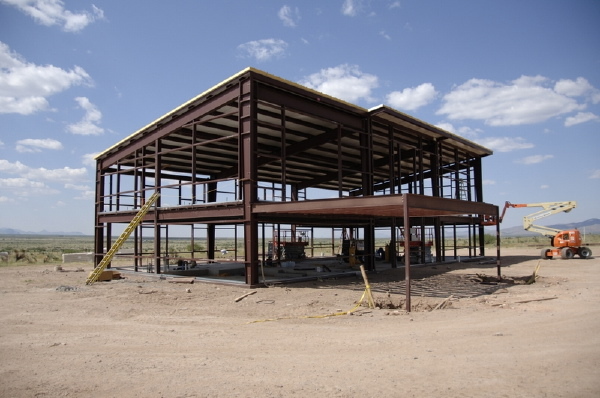 The second floor is framed up, and the roof is on. The framing looks right on and they are certainly doing the design justice - exciting to see. The owner is taking a series of fantastic panoramic photos which give you an expansive view of the framing - really the next best thing to being there. They are posted to their Flickr page, and we have begun mirroring them as well on our own Flickr set, and adding them to the LamiDesign House Plan photo pool. A great view of the back of the house - it really looks like a Tray House now! I love this house and its great to see it being executed so well. More photos after the fold. Here is a photo stream of the latest batch. 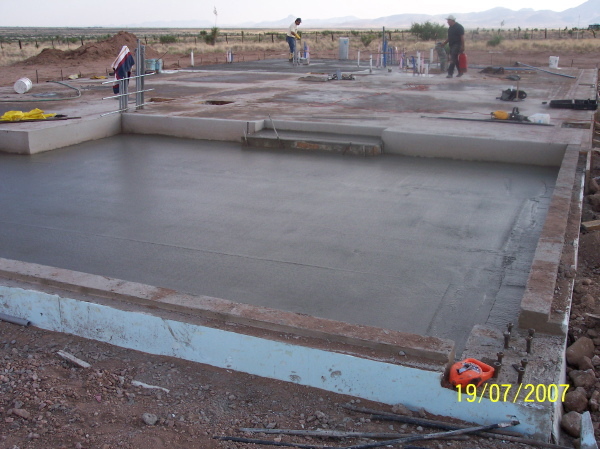 Continue reading "OK Tray House - framing nearly complete"
The stairs in New Mexico have been installed, and we have some pictures from the owner. When we were designing the house one thing that was common to all the variations that were considered was that they all had a prominent stair at the entry of the house. It became apparent that this stair was going to need to be an object that made a statement as it was going to be exerting its presence right where you enter the house. 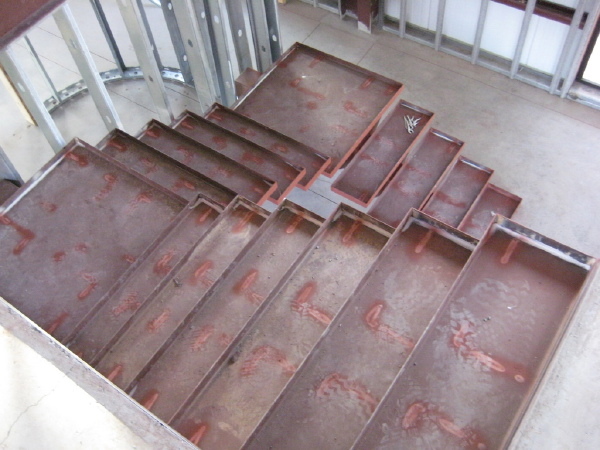 The stair consists of a single steel stringer with cantilevered treads and risers. 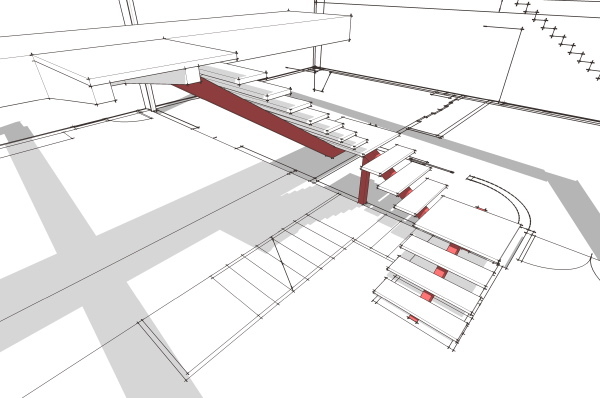 Not a completely unusual configuration, but not as often configured in a U shaped stair. The undercarriage was all exposed and visible, so we did not want to see a post coming down to the floor under the landings. So our posts are actually hidden in the adjacent wall which you can still see here as the wall framing has not received drywall yet. The floor to floor height is high, so the stair needed to be quite long. And we could not have the bottom of the stair crowding the front door. So it found itself pushed back and leading up to a cantilevered landing which hangs off the second floor bridge. The steel work for this landing, and the undercarriage of the stair is all hanging out for view and it has really become a microcosm for the construction of the house - a place where you can get right up to the connections and lay your hands on them compared to the roof and floor beams that are high above your head. More photos after the fold. Included in the photos below are a couple of the alternating tread stair in the observatory manufactured by Lapeyre Stair. This allows for a steep approach to the dome space hatch while still providing a deep tread for solid footing. 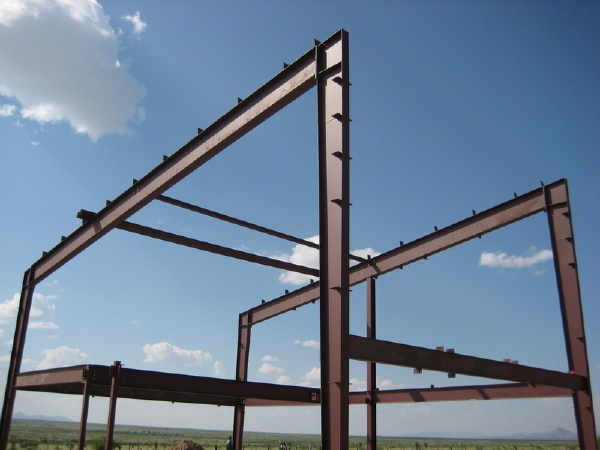 Continue reading "New Mexico EcoSteel House - steel stairs"
Continue reading "Re-Modern Movemenet - Dwell ascends?" 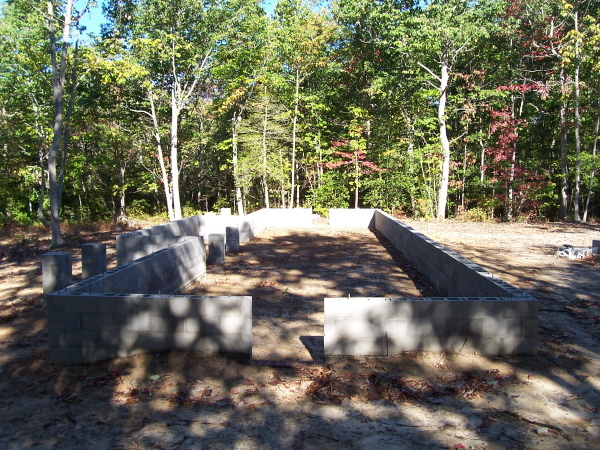 The Plat House under construction in Virginia is ready to begin framing as the foundation work is done. The site looks beautiful and we are really looking forward to seeing the house come together. Remember all the photos of this project will be posted at the Flickr set. Continue reading "Virginia Plat House - foundation complete"
Remember you can see photos of the entire build on the Flickr New Mexico EcoSteel House photo set, and all the EcoSteel projects in the EcoSteel photo pool. 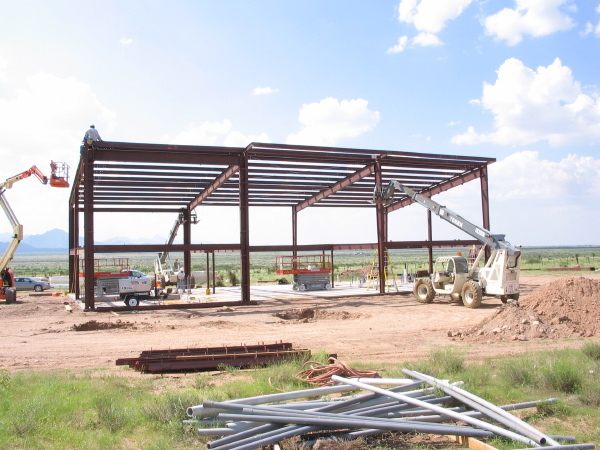 Continue reading "New Mexico EcoSteel - the house review"
Continue reading "Common Pond Plat House - first construction photos"
Continue reading "OK Tray House - second floor framing now"
This is an exciting installment of the New Mexico EcoSteel House story. This week the telescope arrived and was installed onto the instrument pier of the observatory. This was done before the dome was set to ease the installation. The telescope was already installed on its mount, and both were simply lifted into place by the crane. 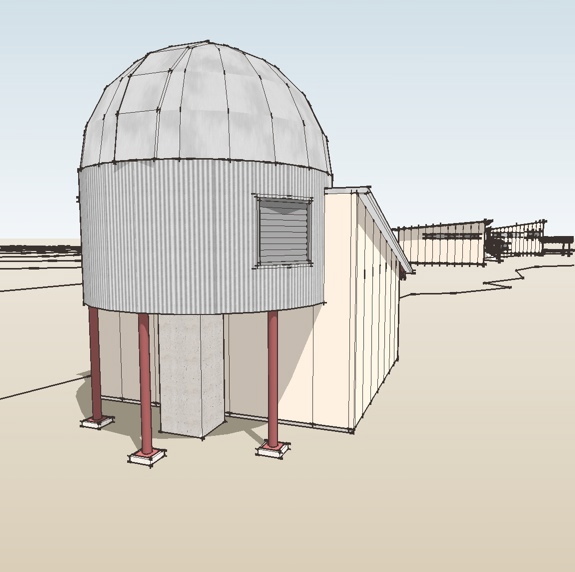 The dome followed the next day completing a big step for the observatory. There is still not power at the site, so the scope is not up and running yet. I'm sure we will see some photos from it as soon as its powered up and calibrated to the control software and dome. In the Flickr photo stream below you can see photos of the scope arriving and being installed. The telescope is manufactured by RC Optical Systems who makes telescopes for astronomy as well as military use. The particular type of telescope is a ritchey-chretien design which is well regarded for its clear imaging and very low distortion. You will notice that it has an open truss-work rather then a cylindrical barrel. This helps discourage thermal convection within the body of the scope, which would cause distortion with the different density of air in the currents - think of a mirage over hot pavement in the summer. 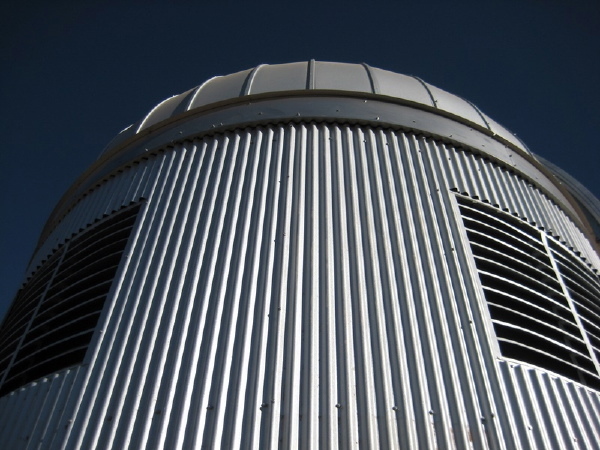 I know this seems like its over the top, but for comparison you should look at a big boy - the twin Keck observatories at Mauna Kea, Hawaii - click through to the interior photos to see the size of their trussed instrument. Our entire dome would fit inside! (these photos are from a visit to the facility by the owners of RC Optical). There is is, looking much like our earlier drawings. And finally the Flickr photo stream after the jump. Remember you can see photos of the entire build on the Flickr New Mexico EcoSteel House photo set, and all the EcoSteel projects in the EcoSteel photo pool. 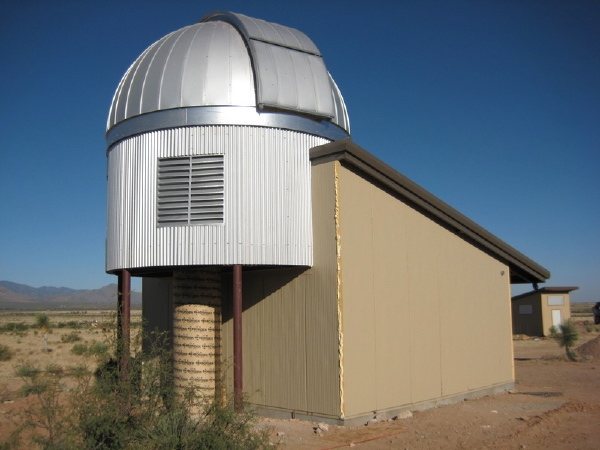 Continue reading "New Mexico EcoSteel House: Observatory scope and dome installed"
This post is for you if you are as big an IBU geek as me. 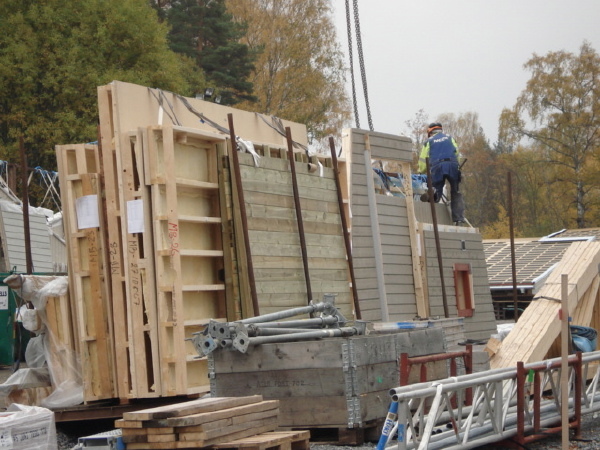 I've been meaning for a while to write up some background on the people helping in my effort to develop IBU housing: Safe Green Blocks, or SG Blocks is a new venture formed by a group of people who have been behind several prominent efforts at preparing shipping containers for building. Long time readers of the FabPreFab messageboards may recognize the name of David Cross. 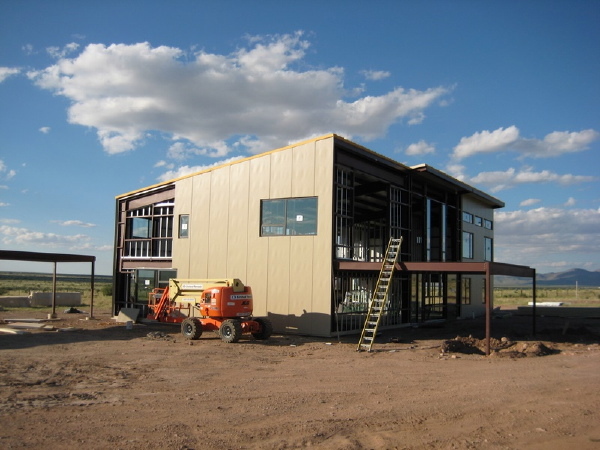 David has a background in the merchant marine and came to the realization long ago that shipping containers made a compelling basis for a construction system, long before it became a focus of attention as an interesting off-shoot of the recent prefab movement. 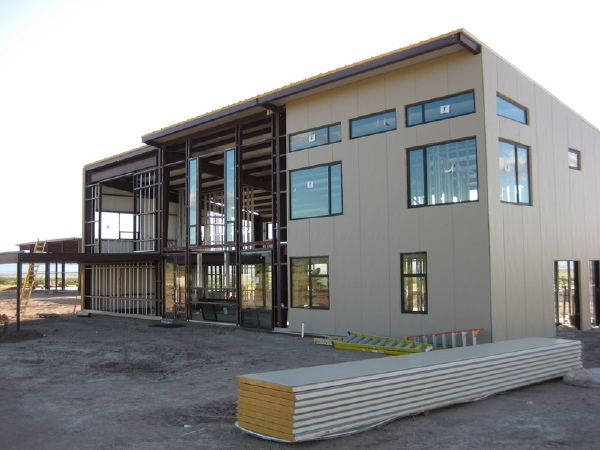 David is perhaps best known for a series of prototype house projects that he ushered through various permitting and funding hurdles, with one of those projects in Tampa receiving widespread publicity as the focus of several segments of Bob Villa's tv series. However his first prototype was built in North Charleston, South Carolina, and shocked the readership of the FabPreFab messageboard when it was posted - up till then the whole idea of building houses with these things seemed like just a theory. When David began these efforts they were an offshoot of the work he was doing in container modification for the Tampa Armature Works, or TAW. 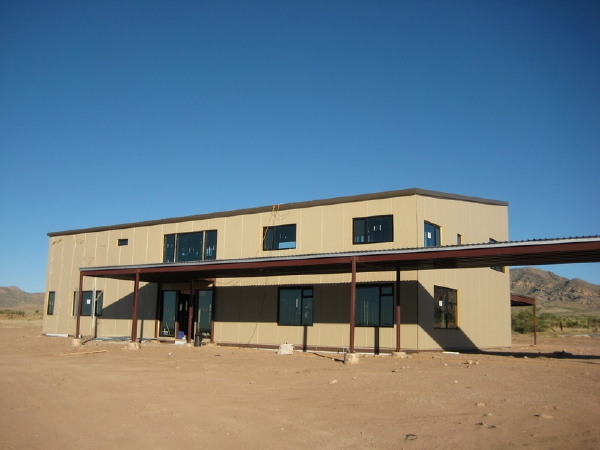 A large vendor in remote site power generation, and associated shelters David's container expertise was being put to work for them in their main business. 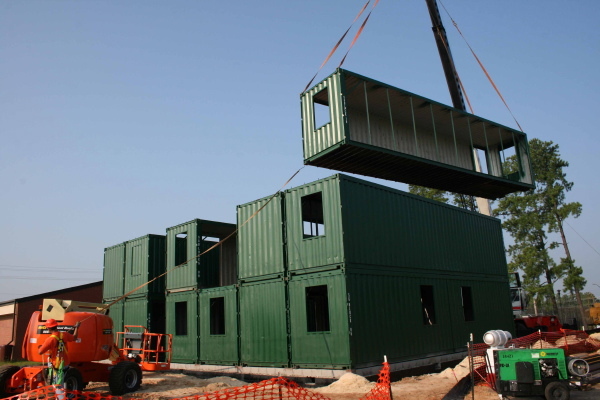 At the same time they were supportive of his pursuit of housing and building with the containers as a way to expand this part of their business. Eventually however they parted ways as David set out to concentrate on this 100%. Joining him were business partners that had previously provided engineering and logistics expertise in the container mods that he had done before - SG Blocks was born. One of these partners is Steve Armstrong, a structural engineer who has over the years provided David with consultation on container mods, and was in from day one on David's efforts to create housing. While David was on his journey Steve was on his own. During this span of time Steve went to work for a large senior housing developer, Stratford, and while he was there he continued to consult to David. Enter Bruce Russell and Paul Gavin who were with Stratord and watching the work that David and Steve were doing. This group formed the foundation of SG Blocks which was completed with a relationship with ConGlobal, an nationwide container handler who provides the raw material at sites all across the country. 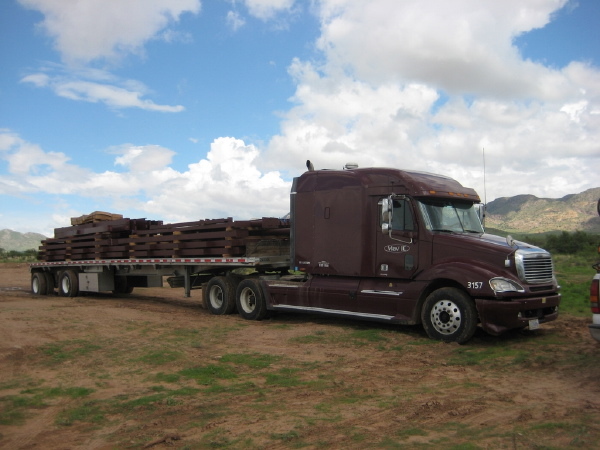 These multiple depot sites double as fabrication sites allowing them to cover the entire country, and reduce shipping distances. So in one way or another the partners of this group have had a hand in many of the container projects you have seen on the internet, and they have been providing technical back up for me as I've worked up my the design of my proposed system. 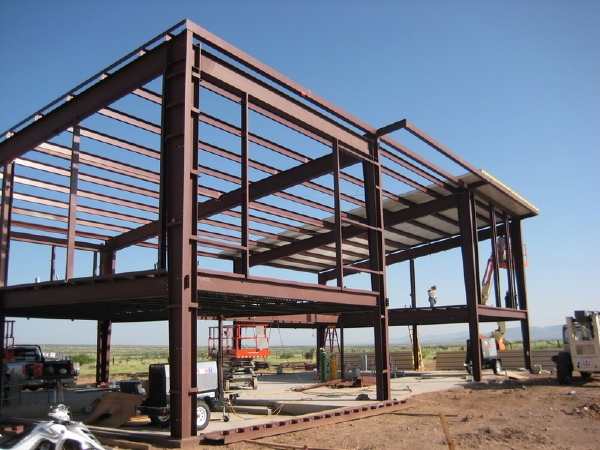 They have the technical know how to see projects through to completion including the backup that may be required for a rigorous permitting environment. Here is a link to their site: http://www.sgblocks.com/ And here is a link to an article about their business: SG Blocks in Charlseton Business. A good read if your interested in this. Now, lets build some IBU houses people! 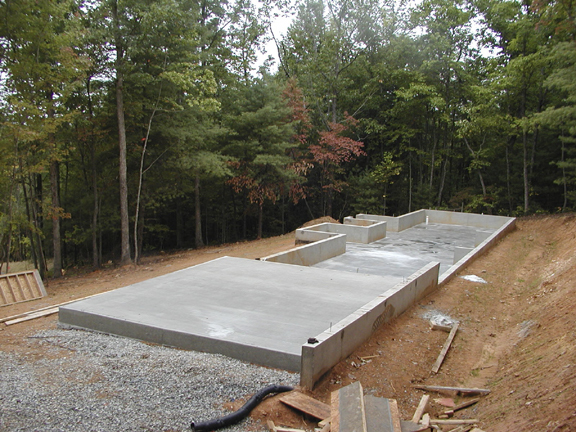 Continue reading "IBU Houses - Safe Green Blocks LLC, the wizard behind the curtain"
We are very pleased to introduce a new customer build, this time the first customer to follow up and show us the construction of their 0367 Porch House. 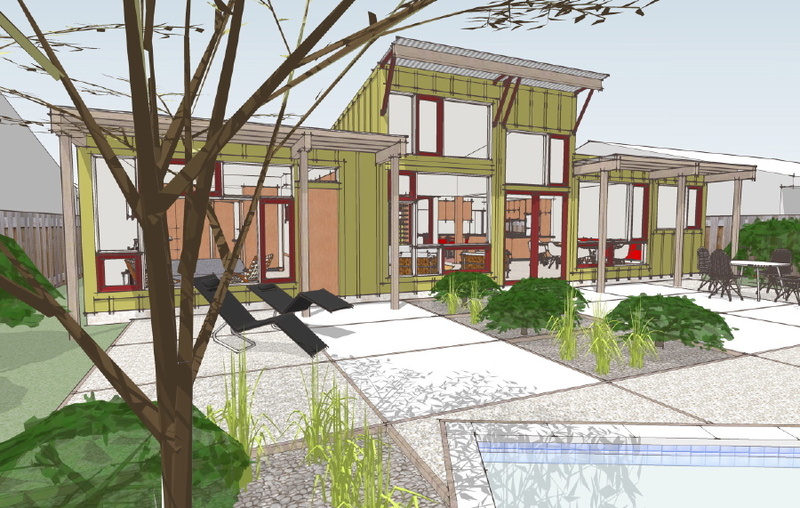 I won't spend time reviewing the design of the Porch House here on the blog. If you are not familiar with the house I'd encourage you to click through and look at the design as you review the construction photos. The house was intended as a weekend or vacation house, although there is no reason it could not be used for a full time residence or modified in any other personal way. The most unique feature of the house is the ground level screened living area. This really lets you transform the house during fair weather allowing you to move your life into the living and sleeping porches. 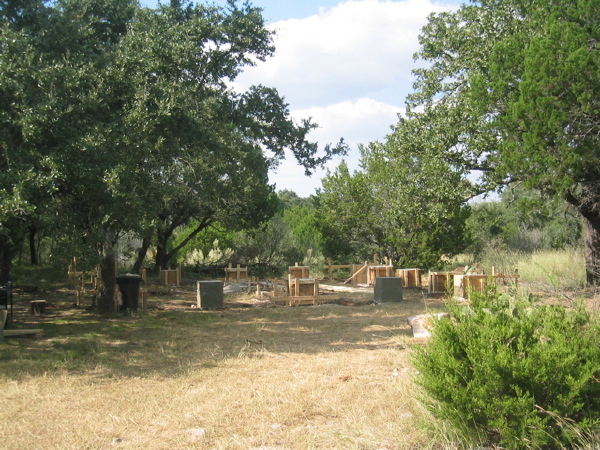 The owners have a great site nestled among a stand of live oaks and cedars. 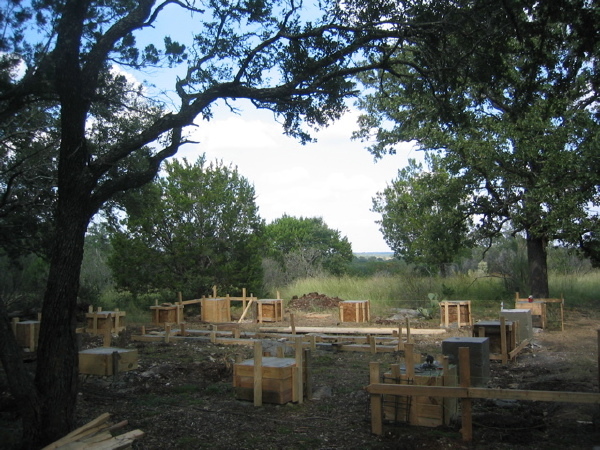 They are building the Porch House right between several of the trees which I think really reinforces that connection between the inside and outside. 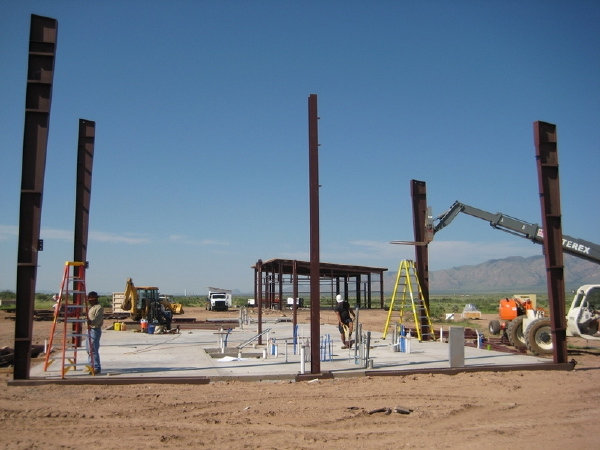 In the photos we can see their footing piers in process. The long footings in the center lie below the stair which should give you some orientation to the floor plan. The owners are going to be using some interesting green tech in the house. They are planning on a composting toilet, and a small septic system that will deal only with grey water from the sinks and kitchen. They are also going to be collecting rainwater, and they have plans to modify the roof slope to simplify the collection of the run off on one side of the house. We'll have to watch and see how that plays out. 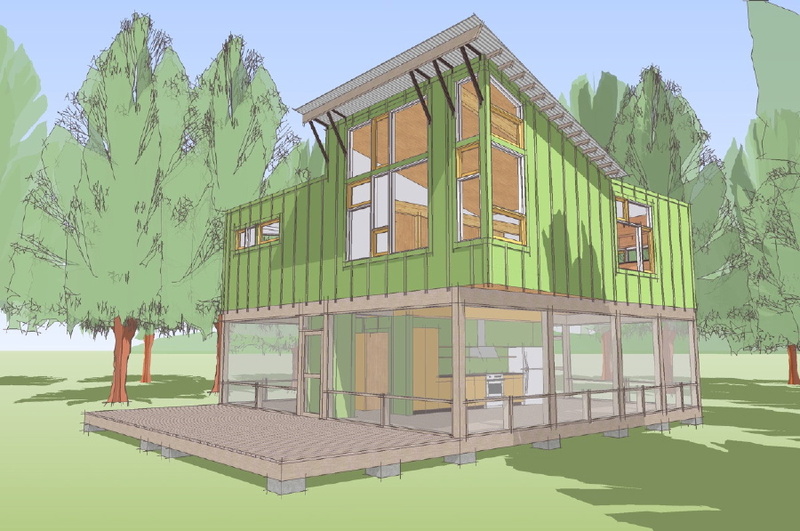 Their long range plan is to add a 0242 Plat House to the site here and with a connection between them use both structures to house their growing family. This is a great plan and again is another great opportunity that the houses offer as they all share some common design themes. So we would like to welcome them to the LamiDesign modern house plan family and thank them for sharing their project with us, and with you here on our blog. And its a good time to throw back thanks to materialicious who made a very appreciated appeal to see this very house built; and also to Land+Living who covered the Porch House in their blog several years ago, where it has continued to be one of the most commented entries on their site. Thanks for the support and I hope you all enjoy watching this as much as me. 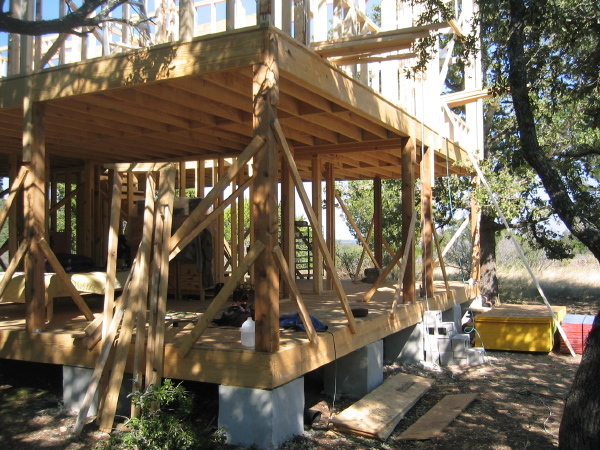 Continue reading "Austin, Tx Porch House - a brand new customer build"
In typical fashion, once the carpenters get to work the house takes shape very quickly. 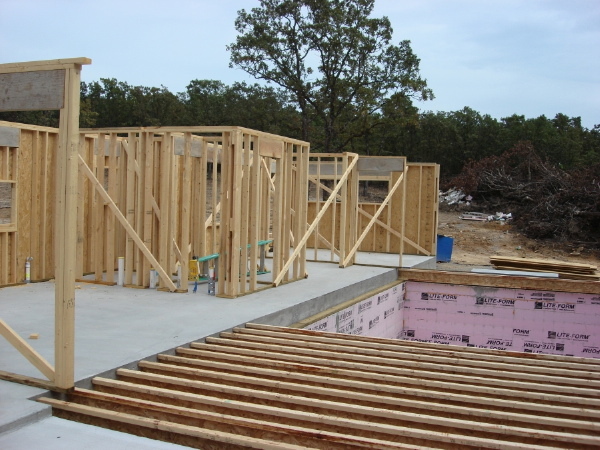 The Oklahoma Tray House appears to be no exception as in the interval since the last photos were received the garage and half the ground floor framing is up. 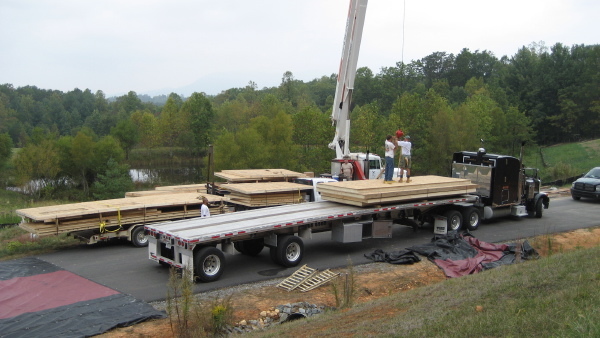 There is a lot of lumber staged on the site for the rest of the house as well. This view below is from the rear of the house, which if you reference the Tray House floor plan lays out with the garage at the left, and the kitchen in the middle, and living room to the right of the framing we see here. And from the front we can see the large window in the living room and the recess at the front porch and entry. The horizontal windows at the kitchen, and the taller window from the mud room at the far end, with the garage beyond. Here we can see the joining of the slab on grade at the front of the house with the basement construction at the rear, as their floor joists are just going in. Looking to the left you can see the kitchen which is open to the living spaces which will be over the basement, and the laundry and rest room that are between the kitchen and the entry to the house. The setting for the house looks great and they will enjoy a nice view of the woods out of the back of the house from all the living spaces. I'm sure the second floor framing will follow soon so keep watching. Remember, you can also follow the construction with all of the owner's photos at their Flickr site. 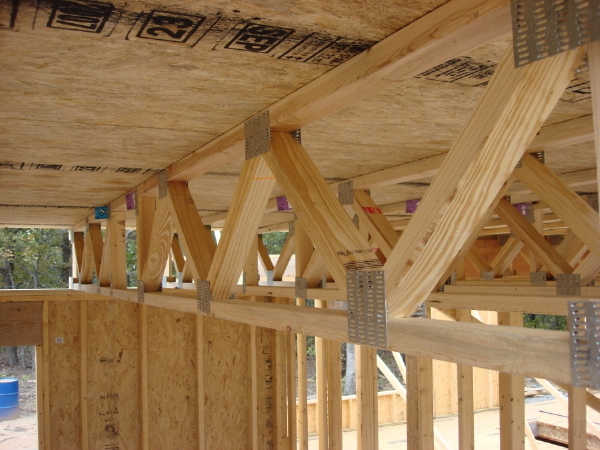 Continue reading "OK Tray House - Framing up"